Rice is so important to many Asian countries. In Thai, to have meal we say 'gin kow' which literally means 'eat rice'. In Thailand, rice is not a side dish, it is the central dish and all other things that you eat, support it. In a Thai meal, you generally eat more rice than anything else and it serves as the foundation for the food pyramid. 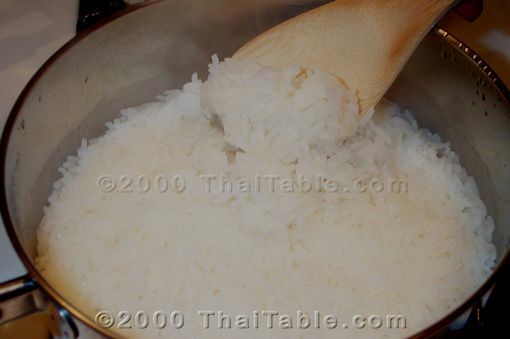 This recipe is for the fluffy white rice that you see with 90% of Thai dishes. This is not sticky rice. Check out our sticky rice recipe, too. The easiest way to cook rice is with a rice cooker. While the rice cooker's manufacturer will give you specific instructions, they always abstract to: Add rice. Add water. Push button. Wait fifteen to twenty minutes. Open lid. Eat. This method of cooking it on the stove is nearly as easy, but may take a couple tries to learn how to make it perfectly. The biggest trick is remembering to turn the temperature down. The Measuring Cup Method: Put rice in a pot that is big enough to prevent boil over (over 1 1/2 quart). Rinse rice in cold water to clean it. The ratio of rice to water is usually one to one and a half. However, if it is a new crop which still has a lot of water content, use 10% less water. Some people like soft rice, some like hard rice. Add more water if you like softer rice. The Knuckle Method: Add as much rice as you think you need. Rinse rice and add water a knuckle high--the water should come up one knuckle of you finger from the top of the rice. Surprisingly enough, this seems to work no matter how big your hands are. With the lid off, turn the heat on high until the water starts to boil. 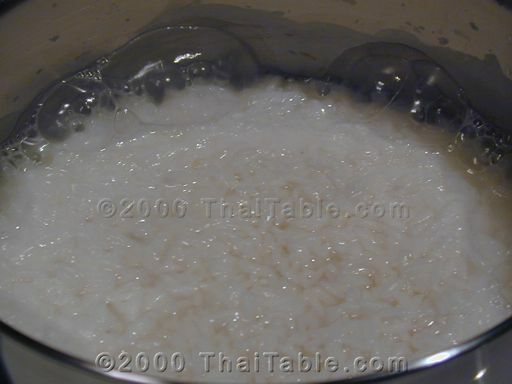 Then turn the heat to simmer and watch the pot until the water level reduces to just above the rice. The exact point you should be watching for is when some of the rice is above and some of the rice is below the water. If you miss that point, add a little more water and then let the water heat up before covering. Cover the pot and turn the heat down to the lowest heat available on your stove. It should take about 5-10 minutes until all the water is absorbed. Turn off the heat and keep the cover on until you are ready to serve it. If you are making rice for fried rice, reduce the water by 10% to get a firmer rice. It is easier to cook fried rice with firm rice because it is less likely to clump together, absorbs more seasonings and tastes better. 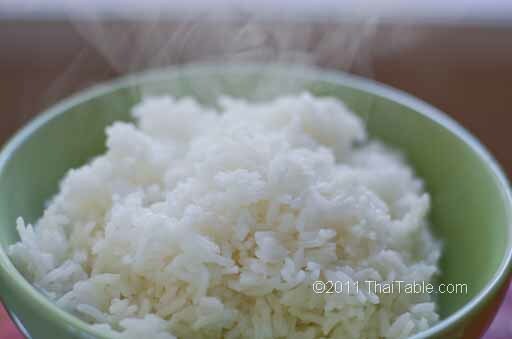 In cool climate, rice is good for a couple of days at room temperature (65 degrees Farenheit). Keep the rice away from heat sources like stove or oven. In warmer climate, refrigerate rice as soon as it cools.